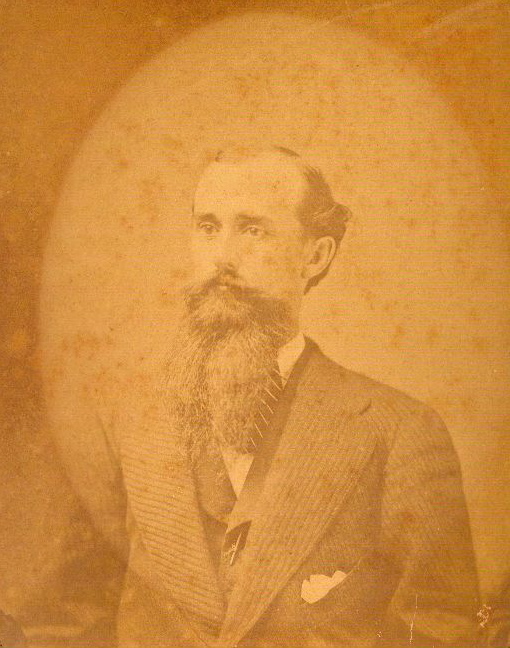 Circa 1875 photograph of Aaron Stanton (1840-1918). A son of David Stanton and Anne Winston, he was born at Travelers Rest near Natchez Mississippi. Aaron, along with his father and brother Samuel, expanded the Billiard Hall into a house. 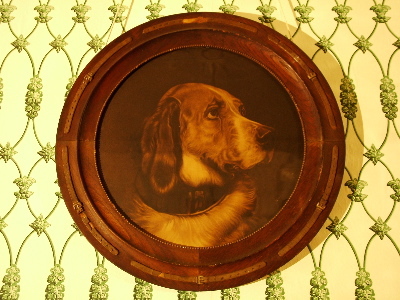 The two sons owned the house jointly until the Stone family acquired it in 1877. Aaron married Elizabeth Brandon and moved to her family home Brandon Hall on the Natchez Trace. This original photograph was a generous gift from Kathy Marshall and Merrill Flinn, a descendant of Aaron Stanton. whose Brother Frederic Built Stanton Hall. Now Known as the STONE HOUSE after the Stone Family which has Owned the Home for over 130 Years. A Highly Ranked Natchez Historic Inn since 2003. 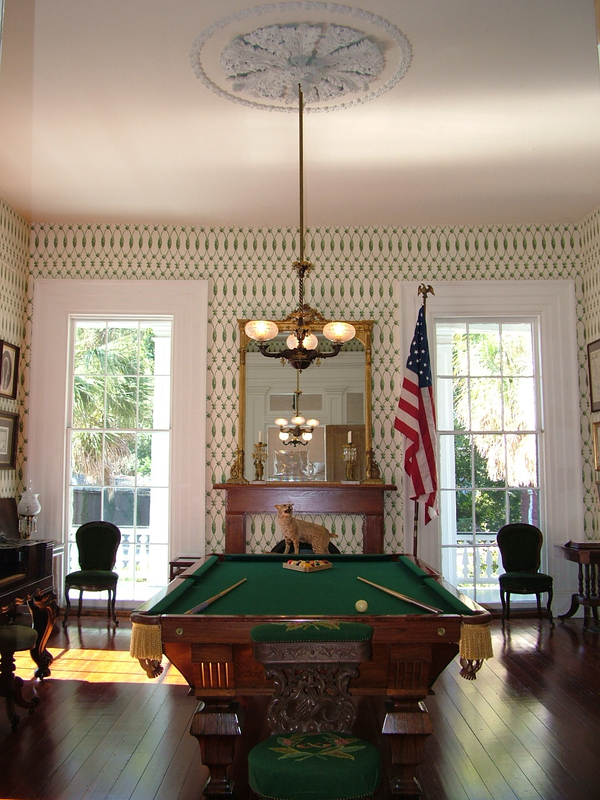 Bed & Breakfast guests are invited to a tour of the Antebellum Billiard Hall. 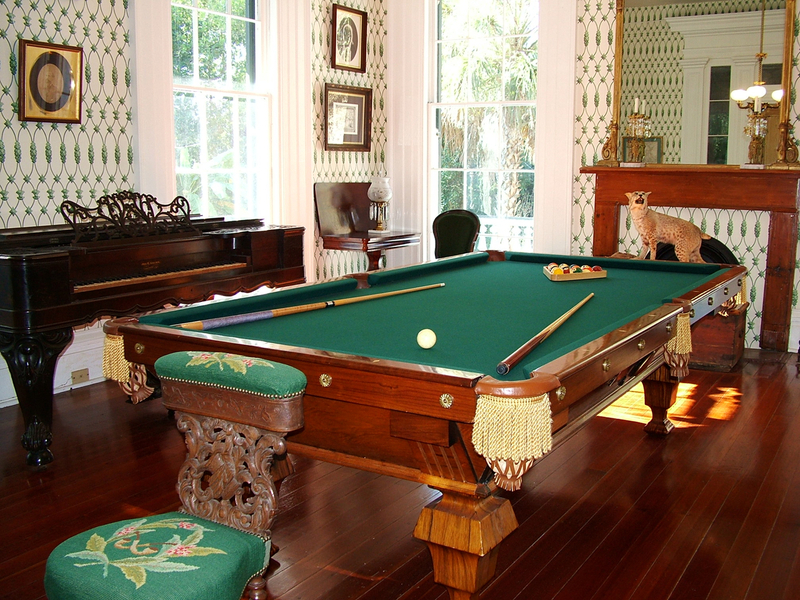 The Billiard Hall features 10-foot floor-length windows, a Napoleon III mirror, and early 19th century games tables. Antique billiard table by Brunswick-Balke-Collender, circa 1885, and Rococo rosewood square grand piano, circa 1860. A rare Pennsylvania inlaid cherry corner cabinet, circa 1800, displays unique Natchez antiques in the Billiard Hall corner. Original Billiard Hall facade and porch area now enclosed as hallways, with floor-length shuttered window visible at right. Ornate plaster ceiling medallion identical to one at Rosalie. Starr and Fellows gasolier with period Greek key shades. this painting came from Elgin Plantation. 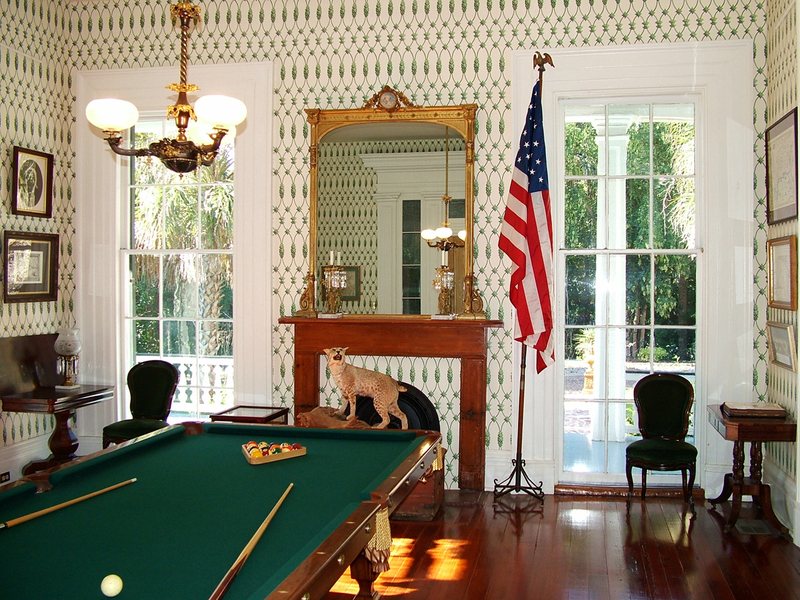 The Billiard Hall is the oldest part of this Natchez Historic Inn. Built circa 1850 by David Stanton, whose brother Frederic built Stanton Hall, this luxurious stand-alone structure served as the Stanton family's private social gathering place. It stood on the grounds of David Stanton’s home The Elms, also now a Natchez MS bed and breakfast, and was later expanded into a house to accommodate his two sons Samuel and Aaron. Both Stanton homes The Elms and Stanton Hall have been famous tour houses for over three quarters of a century. 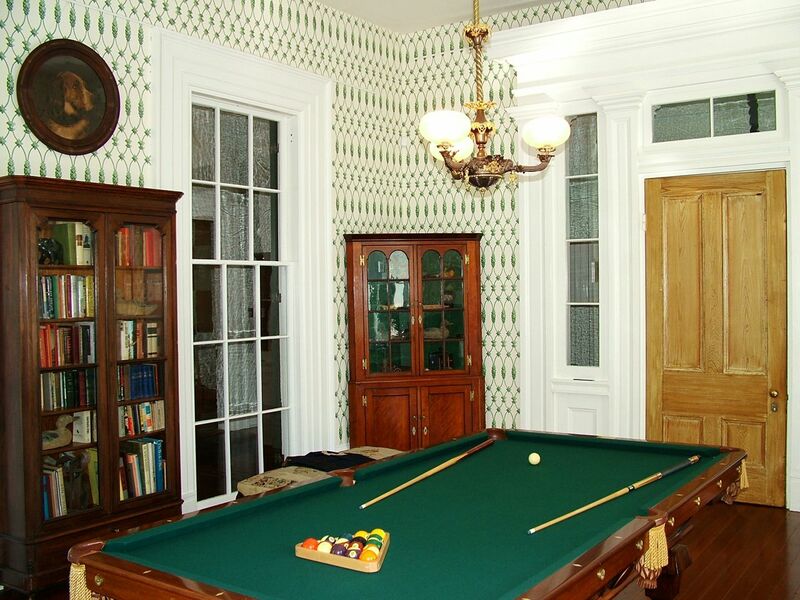 The billiard room was used as a bedroom for most of the 20th century by the Stone family. After restoration was undertaken from 1999 to 2003 by the present owner, Joseph B. Stone, the room was reinstated as a billiard room to be used as such by guests at this unique Natchez Historic Inn. The Billiard Hall consists of a single room 22 feet long and 18 feet wide, with a ceiling 13 feet high, originally surrounded on all sides by 9-foot-wide colonnaded galleries. With four columns across the front and back, and five columns along the sides, the architecture was in the style of a Greek temple, and was the most luxurious private dependency in Antebellum Natchez. The columns were joined on all sides by a substantial wood balustrade with sawn balusters resembling an hour-glass form. At the front the single entrance is surmounted by an elaborate architrave encasing four sidelights on either side and a double transom above, epitomizing the Natchez Greek Revival style. Each side wall and the rear wall feature two 10-foot-high floor-length windows, with a fireplace on the rear wall centered between these walk-through windows. Heart pine comprises the floor while cypress is the primary wood used in the beams, elaborate trim, shutters and door, with the door retaining the original lockset. Both the interior and exterior walls retain the original plaster on cypress lathing, the exterior walls being scored to resemble quarried stones, a feature found on many early Natchez structures. The original intricately pierced plaster medallion adorning the ceiling is identical to one in the main hall at historic Rosalie, and features a period three-light gasolier mounted with shades etched in a Greek key motif. With the six tall floor-length windows that could be opened onto the surrounding galleries, this spacious edifice provided a bright, airy entertainment space for one of the most prominent social families of Antebellum Natchez Mississippi. A view of the rear of the house showing the back wall of the Billiard Hall with two floor-length windows, the original pyramidal roof-line, and part of the colonnaded wrap-around gallery. 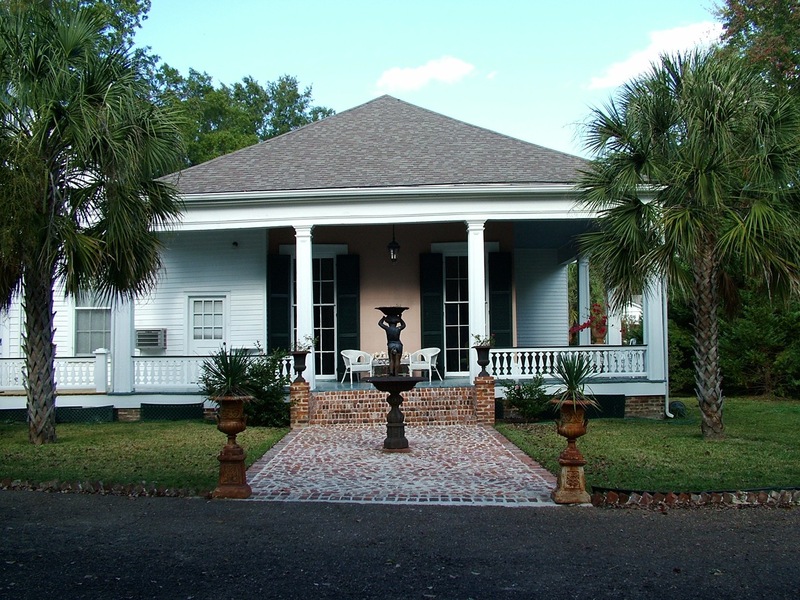 This Natchez Bed and Breakfast includes a Master Bedroom and a Cottage. When the Stantons began the house expansion across the front and down one side of the Billiard Hall, those parts of the surrounding galleries were enclosed as hallways which now contain the massive original Greek revival entry and some of the windows. 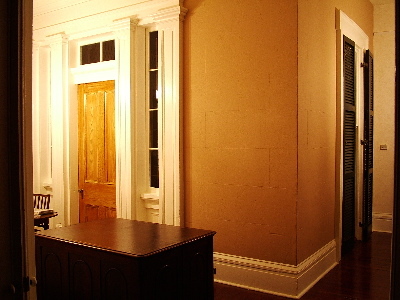 The elaborate front entry architrave was replicated for the front entry to the house, as was the balustrade for the added front porch; the 13-inch-high baseboard and the style of the floor-length windows were also replicated throughout the house addition, with all the added interior door frames built in the style of the floor-length windows. Still present are the original locksets with porcelain doorknobs and brass rosettes and keyholes. These architectural features are found in the bed and breakfast Master Bedroom. The front half of the house addition was divided from the back half, (which had been the billiard hall), by two sets of large fenestrated pocket doors, stunningly ornamented with stained, etched and painted glasswork, all of which is retained today. Joseph Newman Stone bought the house from the Stantons in 1877, and it is now owned by his great-grandson Joseph Britton Stone who operates it as a Natchez Historic Inn. It has been ranked among the best Natchez MS bed and breakfasts since 2003, and received the TripAdvisor 2012 Travelers' Choice Award for the Top 25 Bed and Breakfasts in the USA. Contents of this page © 2007 Joseph Britton Stone.